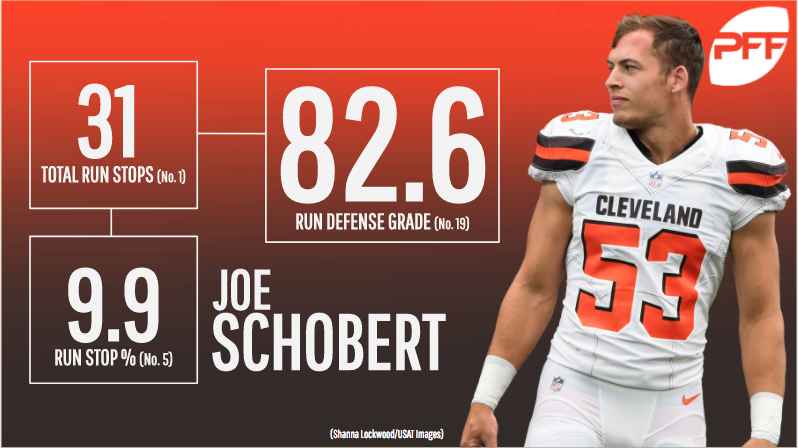 Cleveland Browns second-year defender Joe Schobert has quietly become one of the league’s top run-stuffing off-the-ball linebackers, despite playing at the line of scrimmage off the edge for a majority of his football career. Now playing 75 percent of his snaps off the ball as a stand-up linebacker, Schobert leads all NFL’s linebackers in total run stops with 31 and is fifth in run stop percentage at 9.9 among linebackers with at least 160 snaps against the run. He has also earned an 82.6 run defense grade, good enough for 19th among all qualifying linebackers. Schobert’s recent success against the run comes as a pleasant surprise to the Browns’ coaching staff given his lack of experience in an off-the-ball linebacker role. Brought in as a fourth-round pick in 2016, Schobert had played over 78 percent of his defensive snaps at 3-4 outside linebacker or 4-3 defensive end in his final two years at the University of Wisconsin. As a senior, he led FBS edge defenders in pass-rush productivity (23.5), recording 49 total pressures on 323 pass-rush snaps. As expected, Schobert took on a similar role in Cleveland as a rookie. He played 91.5 percent of his snaps along the edge of the Browns’ defense last season, while just 4.88 percent of his snaps were spent at off the ball. However, his success in Madison didn’t carry over to Cleveland. 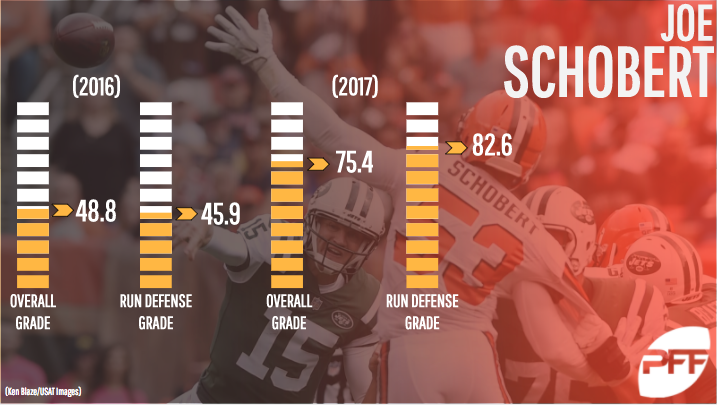 En route to earning a 50.8 pass-rush grade in 2016 (98th among 124 edge defenders), Schobert recorded just seven total pressures (four hurries, two hits, one sack) on his 73 pass-rush snaps last season. He also flashed little-to-no potential against the run, finishing with the 95th-ranked run defense grade (45.9) among 124 qualifying edge defenders. In 2017 however, a much-improved version of Schobert has taken the field for the Browns. Most recently, he recorded four run stops on just 28 run snaps on the road against the Cincinnati Bengals. Though Cincinnati’s Joe Mixon was able to break off 114 yards on 23 carries, his performance is an anomaly compared to how well Schobert & Co. have defended the run this season. Now 12 weeks into the 2017-18 season, Cleveland ranks eighth in rushing yards allowed per game (97.2) and second in yards allowed per carry (3.3), both of which are dramatic improvements from last season. The Browns’ run defense ranked tied for 28th in yards allowed per carry (4.6) and 31st in yards allowed per game (142.7). To place the Browns’ improvement against the run solely on Schobert’s shoulders would be unjust, as fellow linebacker Christian Kirksey has also excelled in his move to 4-3 outside linebacker after playing inside in the Browns’ 3-4 scheme last season. However, there’s no question that Cleveland is reaping the benefits from Schobert’s successful transition to off-ball linebacker.